All Corseted™ brand corsets, and accessories, are designed and hand made by Generations of Art with care and precision. Our designs can fit can fill all of your costume needs. From Cosplay, weddings, steampunk, or just a night on the town, come see our designs, and build your unique look today. Generations of art travels all over the country to bring you the finest handmade products! Find us at a Con near you, or contact us for a consultation! In an effort to reduce our footprint, we will be using recycled products whenever and wherever possible. From repurposing leather, fabrics, and glass, we hope to bring new life to materials that are still in excellent condition and reusable. Know that when you're buying a GoA product, your helping to contribute to a cleaner planet. Look for our green products today! ​The GoAlong is available now, some with the upgrade with the RFID personal security pocket. The GoAlong is the name we've chosen for our Bag line in keeping with the GoA acronym for Generations of Art. The GoAlong is a backpack/purse/messenger bag in one. It will also be designed with an RFID personal security pocket. 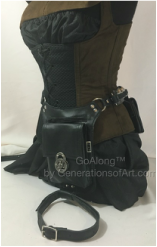 Goalong worn at the hip as a holster bag. How to Lock-lace your new GoA Corset! For years we have had a trade in policy. 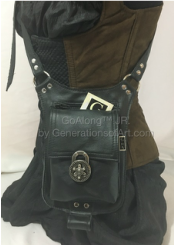 If you have outgrown your corset, or are just ready for an upgrade, (AND If you've taken very good care of your corset); Clean it, Bring it in to us at a show, and receive up to half of your purchase cost towards a new corset, custom order, or any GoA product. Your old corset will then be recycled and put on the rack for those looking for a deal. Corsets can be pricey, and we all like a good deal! One of the many ways we are going green! As always, we offer a 10% discount to our repeat customers on new purchases.